St. Petersburg and Novosibirsk, Russia: March 3, 2014 -- LEDAS Ltd. and ASCON today jointly announced the successful integration of ASCON’s C3D kernel into LEDAS Geometry Comparison technology. This is the first third-party component to benefit from the C3D kernel; previously, third parties had only developed CAD/CAM software as applications on top of C3D. LEDAS develops computational components and provides R&D services for the CAD/CAM/PLM market, while ASCON is the leading Russian CAD/AEC/PLM vendor and developer of KOMPAS-3D modeling software and C3D kernel software. 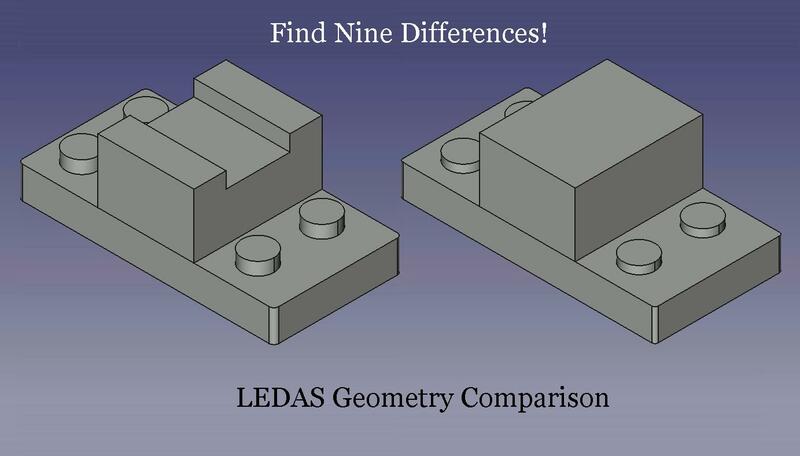 LEDAS established its Geometry Comparison technology to check and locate all of the differences between similar-looking geometric models. These changes can come about through revisions made to a model; from files generated by different CAD systems of the same model; the result of polygon and canonic or NURBS representations of the same geometry; or through data generated by various steps in the processing of 3D geometry. ASCON’s conditions for licensing C3D are very flexible, especially for projects that are not yet generating revenue, an important point to a development house like LEDAS. As a worldwide value-added reseller of the C3D kernel, LEDAS gained a detailed understanding of the business benefits related to C3D and its technical capabilities. The history of C3D history goes back to 1995, the year in which ASCON launched its new geometric modeling project. The kernel was initially kept proprietary to the software firm’s KOMPAS-3D software. For 17 years, the ASCON constantly improved the capabilities of C3D based on the real-world application of KOMPAS-3D, and driven by user feedback of Russia’s most popular CAD system. In 2012 the 3D modeling kernel made its public release worldwide at the Congress On the Future of Engineering Software in USA. Development of the Geometry Comparison technology began last year by the LEDAS team of programmers, whose experience in mathematical modeling and computational technologies spans decades. LEDAS is best known for its long-term R&D relationships with Dassault Systemes, as well as its in-house development of LGS 2D and 3D geometric solvers. These solvers were licensed to many CAD/CAM vendors, and then in 2011 sold to Bricsys/Menhirs. ASCON is a Russian CAD/AEC/PLM software developer and supplier founded in 1989. ASCON solutions address key issues of industrial design, engineering, preparation and release of drawing documentation, and product lifecycle management. ASCON software has been successfully applied across many industries, including machinery, automotive, shipbuilding, aerospace and defense, architecture, civil engineering, and electronics. The company has over 40,000 customers around the world. More information about ASCON is available at www.ascon.net.